The ever busy Triplicane came alive with more festivity on the occasion of Float festival [theppam] and today 7th Mar 2014 marked the last day of the annual float festival. Today it was Sri Varadha Rajar. 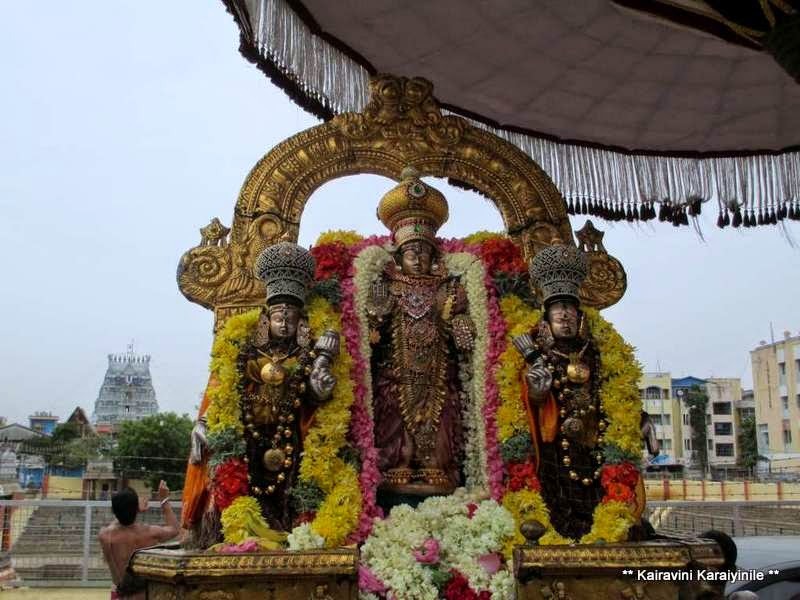 In the sacred Thiruvallikkeni, the Emperuman is in five roopams – Lord Parthasarathi (Lord Venkata Krishnar is the Moolavar); Lord Azhagiya Singar (Yoga Narasimhar as Moolavar); Lord Rama, Lord Ranganatha and Lord Varadharaja. The moolavar of Varadharajar is depicted as on “Garuda vahanam” which is very unique. Sure you know the puranic legend of ‘Gajendra moksham [salvation of elephant Gajendra]’ ~ when Lord Maha Vishnu Himself came down to earth to protect Gajendra(elephant) from the death clutches of Makara (Crocodile). Gajendra the King of elephants, was attacked and caught by a crocodile and death seemed imminent. Gajendra had been rendering service to the Lord by offering fresh, fragrant Lotus and when he appealed to God to protect him, Maha Vishnu appeared on Garuda vahanam, saving the devout elephant by killing the crocodile with his ‘Chakram’. It also explains that one who falls under the divine feet of Lord [prapathi – surrender] seeking salvation will surely be taken care of. The reenactment of Gajendra moksha takes place during the full moon in the month of Aadi. The Sarrupadi [alankaram] for Lord Varadhar for theppam was ‘Gajendra moksha thirukolam’. Lord Varadhar appearing in the form whence he saved the devoted elephant from the savage attack of the mugger crocodile. It was the posture of Lord having released his chakra to save the elephant; One of the arms was in prayoga posture, having released the chakra – holding the azhi [the sangu / conch] in the other, holding Gatha in one and abhaya hastham on the fourth thirukaram. It was indeed a great darshan of the Lord. Appropriate to recall the Thirumozhi pasuram of Thirumangai Mannan on Lord Varadharajar. The elephant Gajendra had entered the beautiful pond where new flowers were available; the crocodile made a beastly attack. Elephant lifted its trunk and trumpeted seeking the help of God; who immediately came to its help astride the bird [Garudan]; that God who used his Chakra for assuaging the elephant is seen at Thiruvallikkeni, the place having well built houses and densely surrounded by pleasant fruit bearing trees. and one taken during the hastham purappadu earlier to make you experience the thirukolam better.